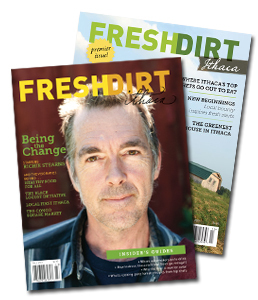 Thanks for your interest in advertising with Fresh Dirt Ithaca! Please contact adsales@freshdirtmag.com for rates and contracts. Contracts for our Fall/Winter 2014 issue (on newsstands from mid-November through at least mid-April) are due by October 8, and art is due by Ocotber 15. For guidance in prepping your ad for publication, please see our ad specs below. Please send your press-ready advertisements to adsales@freshdirtmag.com. All files should have a minimum resolution of 266 dpi and be in CMYK. Image files should be in .tif, .eps, or .jpg format. Full-page ads require a .25” bleed on all sides. If ads do not fit the following dimensions, they will be sent back to the advertiser to be resized to fit the designated space. All live matter should be 1/4” from the trim size on all four sides.